This review is about a new binary options scam called “Hedge Formula”. It is presented by George Dalio. Dalio is the CEO of the Hedge Formula Group that has created a binary options trading software. It allegedly can make you $10,748 per day. Dalio claims that it has made him almost 30 million dollars in one year. The Hedge Formula app is free, but free spots are allegedly limited. Here is the truth. Dalio is a fictitious character played by an actor, the Hedge Formula Group does not exist and the phony Hedge Formula app loses money. The true purpose of the Hedge Formula project is to make you deposit money with a certain broker, because it will earn affiliate commission to these scammers. Not so long ago we reviewed the Click Cash Formula scam and guess what, it was presented by the same guy as the Hedge Formula. But then he was calling himself James Edwards, meanwhile now he calls himself George Dalio. So he is a liar and scammer, no doubts about it whatsoever. Check the picture. In the Hedge Formula video you can see some testimonials, but they are all fake. They were made with paid actors. Look at the example on the right, this guy endorsed countless binary options scams. All the trading and bank account statements shown in the video are fake too. 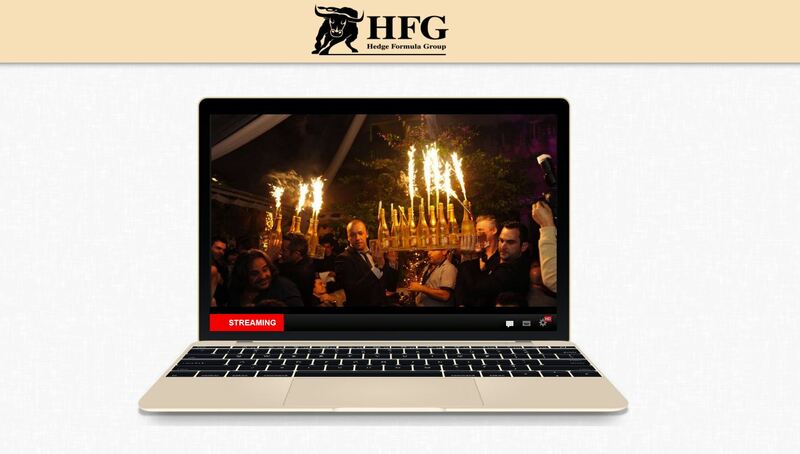 Now let’s have a look at the HFG software that is supposed to make you rich. Not a big surprise, it is the same losing app as used not only by Click Cash Formula, but also Lie Detector Millionaire or Profits Infinity scams. Only scams use this software and it loses money to its users, the feedback we get is absolutely clear about that. Now that you know how Hedge Formula work, you won’t be surprised that it is not free. Dalio might say whatever he wants, but the first thing you’ll have to do after signing up is to deposit at least $250. Otherwise you won’t be allowed to use the software. So you will be risking and losing your own money, if you trade with Hedge Formula. Hedge Formula is a scam that is trying to take away money from you through lies and false promises. If you want to see how money is really made on binary options, try a free demo account. There you can learn how to trade and achieve consistent and real profits. Are there no reputable Binary Option Software on the market? Instead of critising and finding fault with each and every Binary Option system or software, why not recommend a reputable Binary Option software or system instead? Because we don’t know about any reputable binary options software. Do you really think somebody will make you money for free? Binary options are like Forex, stocks or commodities. Only people with good strategies make money. And good strategies are worth gold, people don’t share their strategies, because massive use of any strategy would stop it making profits. This is how financial markets work, this is the hard reality. So keep testing on a demo to find yourself a good strategy to trade manually, or you won’t make money on binary options. And by the way, we are not “critising and finding fault” with binary options programs, we are simply warning against programs that are scams and that will lose you money. But you don’t have to trust us, you can go and try these scams to see who is right.